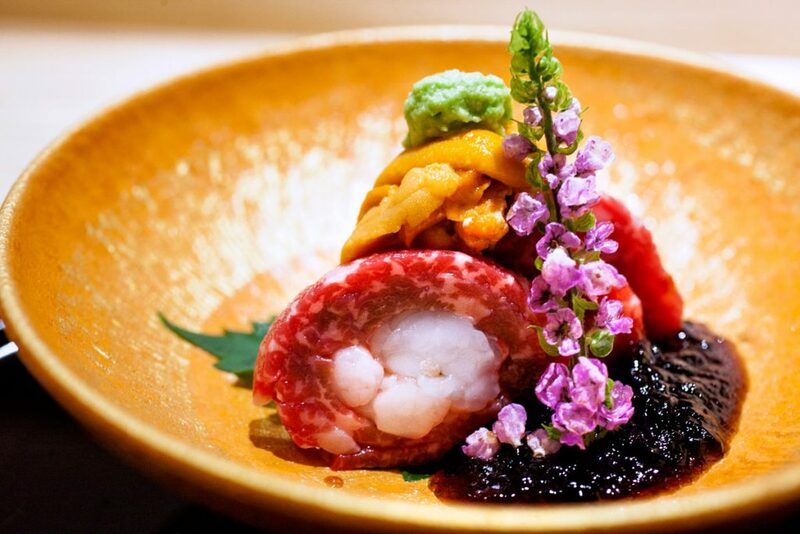 Nestled between a few no-name stores in a sleepy corner of north Jing’an is Machiya, a casual Japanese restaurant helmed by Chef Ichinohe Naoki, a humble yet impressionable gent from Tokyo. The room is bright and spacious with a 12-seater bar taking center stage. Private rooms and booths frame the corners of the room. 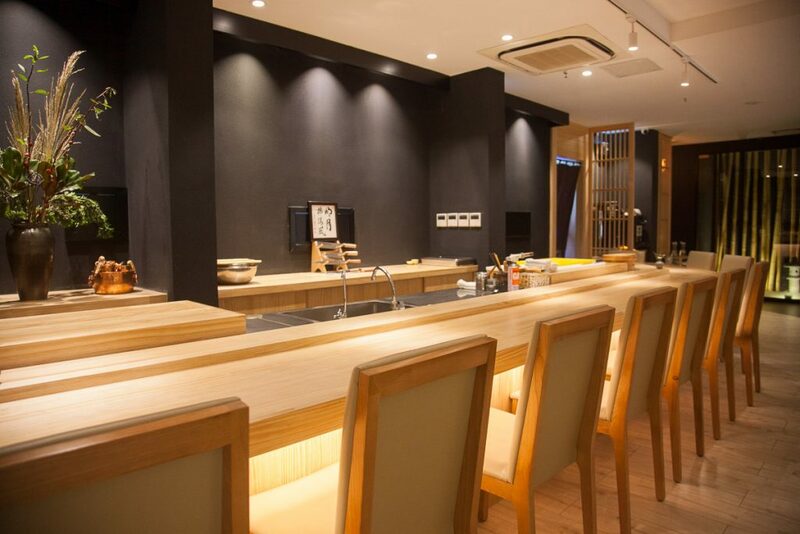 It’s dressed in the minimalist decor of a traditional Japanese restaurant. 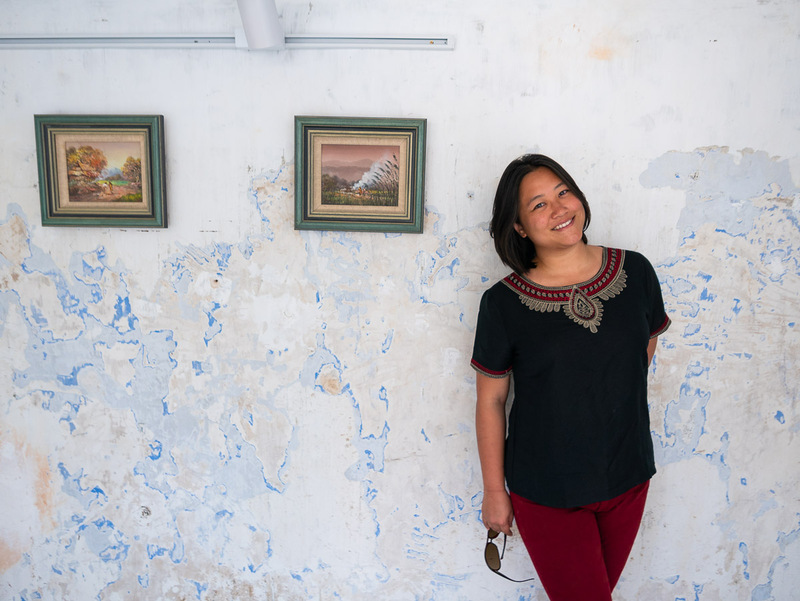 Machiya is operated by restaurateur Karen Chen (Jianguo 328, Unagi and Vesta), who’s pledged her brand identity around offering quality and value for money. And frankly, it’s one of the most memorable Japanese meals I’ve had in a long time at this price point. 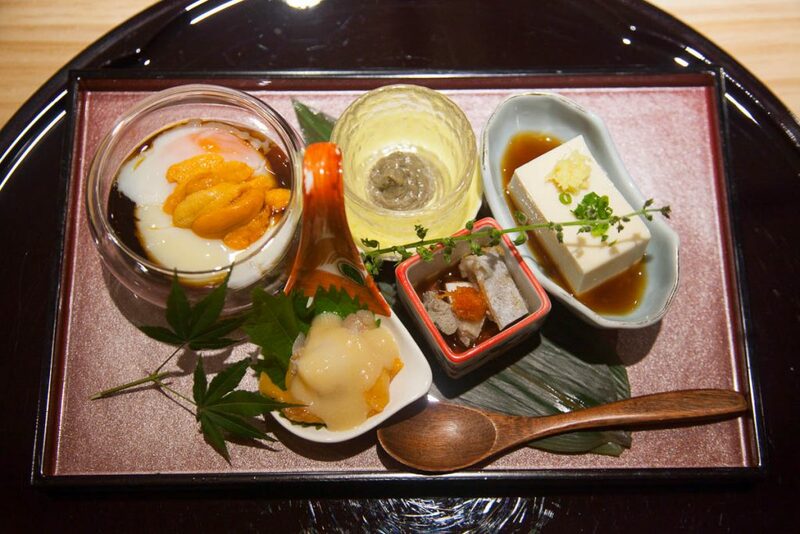 Machiya serves two sets: ¥498 and ¥698. I’d recommend the latter. And here’s a disclaimer from the proprietor, one which I couldn’t agree more with: You won’t find the inferior cuts of salmon sashimi here, so stop asking. 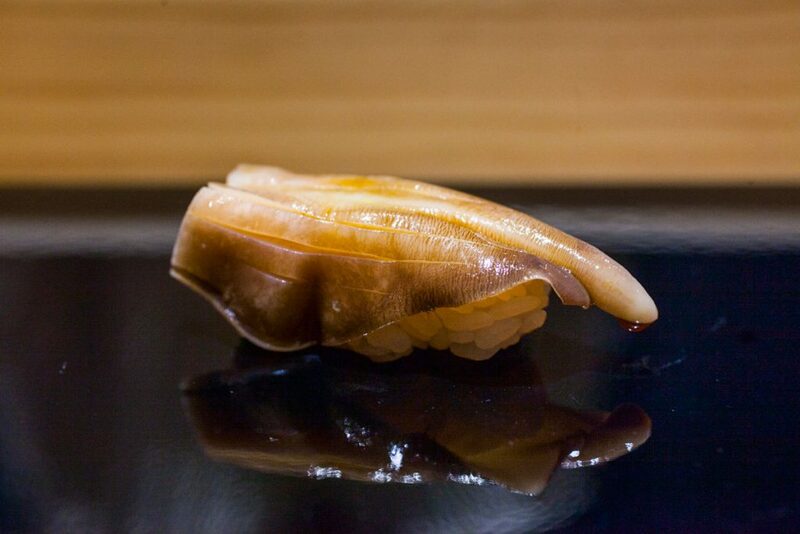 Chef Naoki works his magic with niche suppliers to source his fish, serving the best possible cuts found in Shanghai. That said, if you want your salmon fix, there are plenty of buffets around town where you can gorge to your heart’s content. The set starts off with small plates of seasonal appetizers—a thinly sliced scallop with ark clam, a pate of crab and soy seasoned mackerel. There’s a serving of house made tofu, also available a la carte. It’s a thick and creamy block in light soy sharpened with a spicy snap of ginger and spring onion. Also, you know you’re getting value for money when your first course has two kinds of sea urchin. 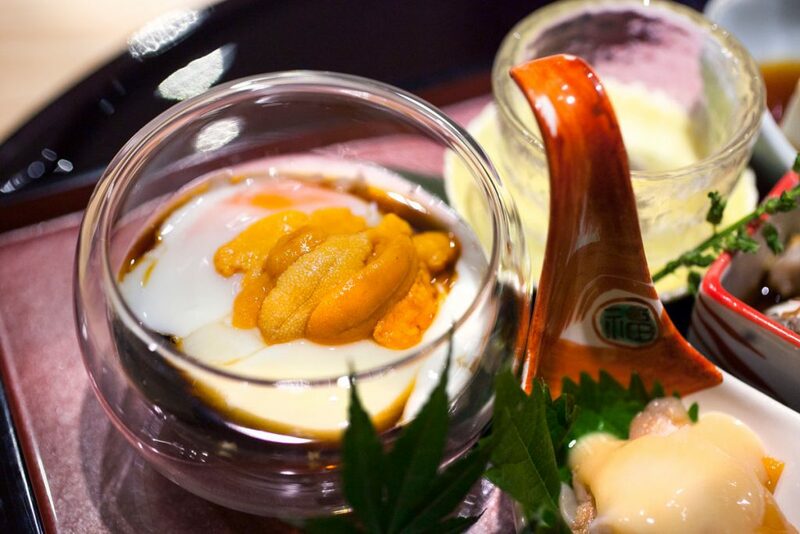 The soft-boiled egg with light soy topped with uni is undoubtedly the highlight of the appetizer platter. It’s a custardy combination that’s rich with umami and is absolutely divine. 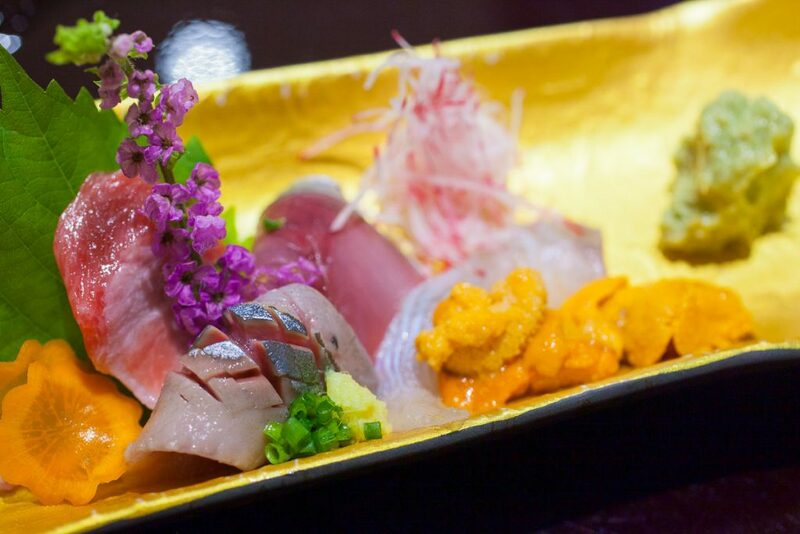 It’s just a warm-up for the next course, a plate of sashimi choice cuts—a slice of fanned-out sanma, also known as pacific saury, Dalian and Japan-sourced uni and a buttery section of otoro. 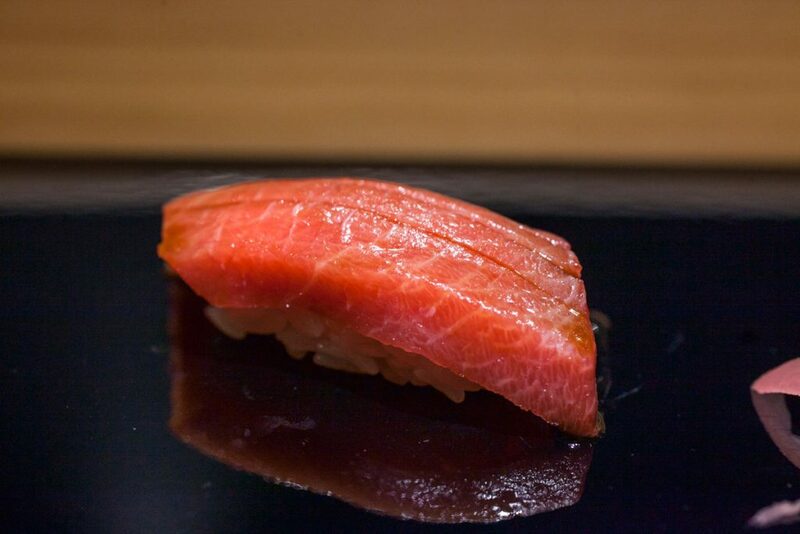 Chef Naoki then turns the spotlight on a deep velvet red cut of katsuo. 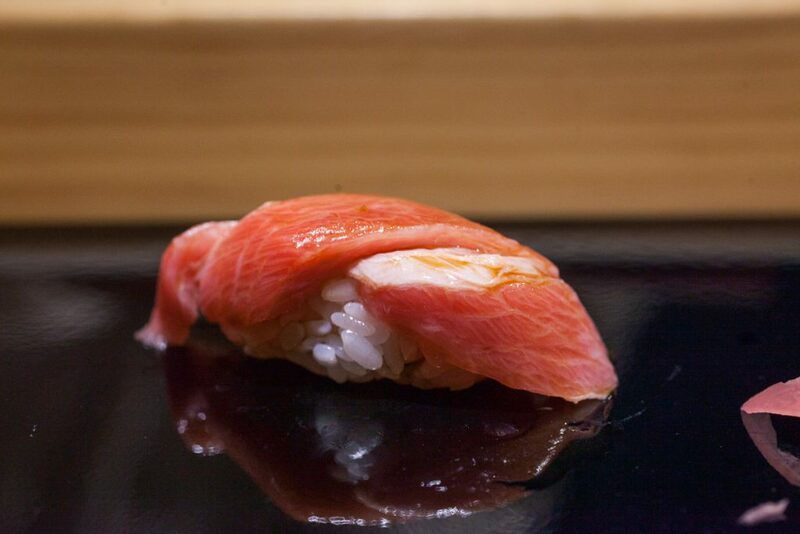 The fish, also known as skipjack tuna, is the same used to make bonito flakes. 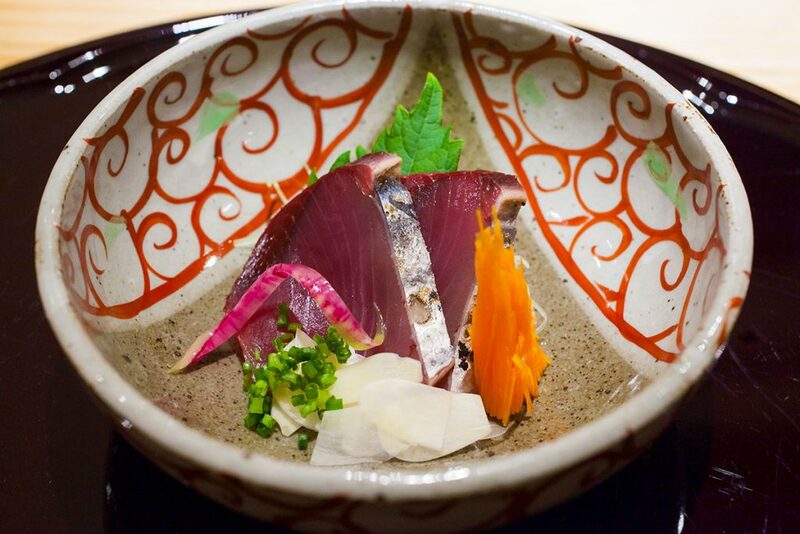 The torched tataki-sized sections come with see-through slices of raw garlic. It’s a bewildering pairing, but the spicy garlic complements the fleshy fish, absorbing the bitterness from the charred skin. 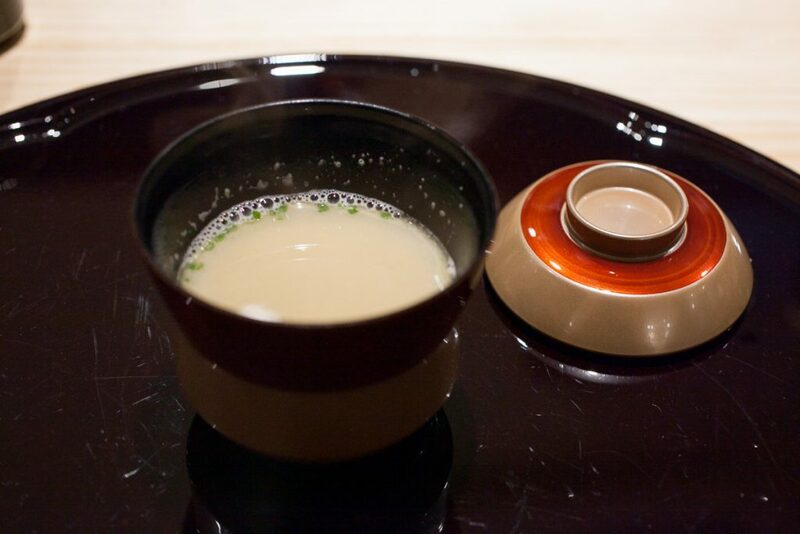 Next is a clear yet lusty broth of deep, earthy matsutake. 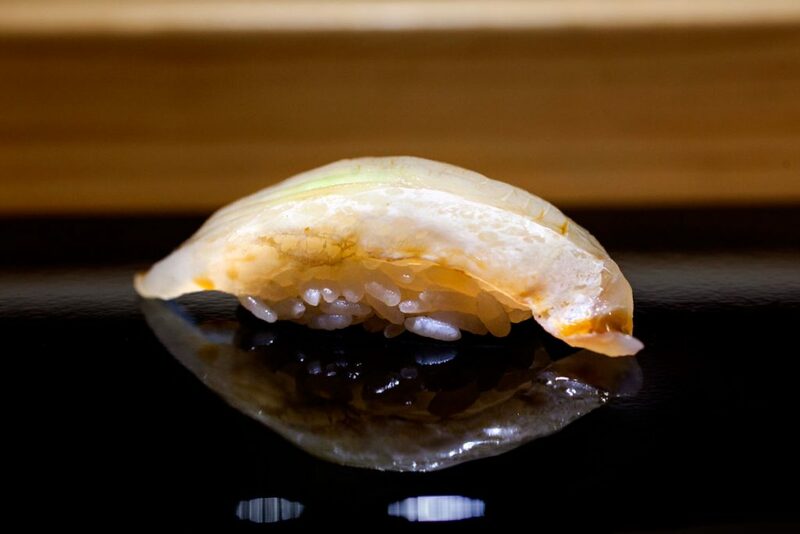 In the soup, a piece of nodokuro, an uncommon variety of trout, steals the show with its flaky, sweet flesh. Pacific saury makes another appearance as a hot dish. 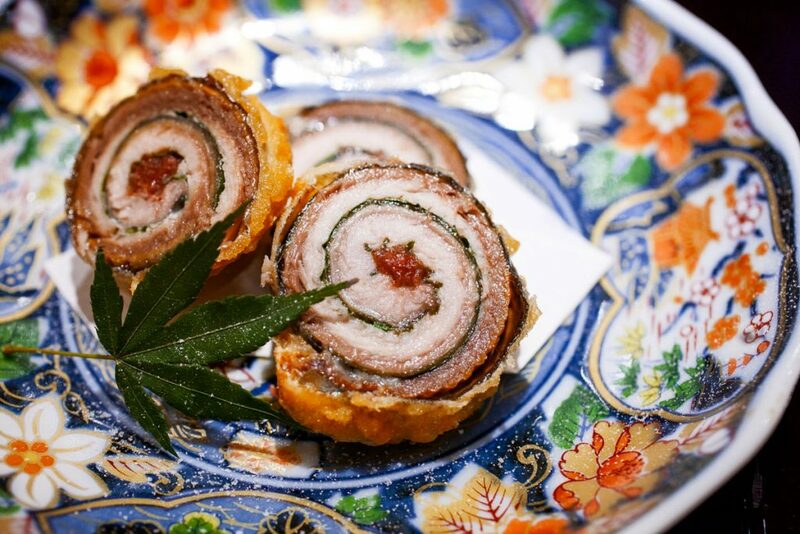 It’s skin-on, salted and rolled up with shiso leaves before being lightly battered and then deep-fried. The sweet and sour plum sauce center completes the tart and savory medallions. At this point, you know your money is well spent as the table is graced with five more pieces of nigiri before the final soup and dessert. 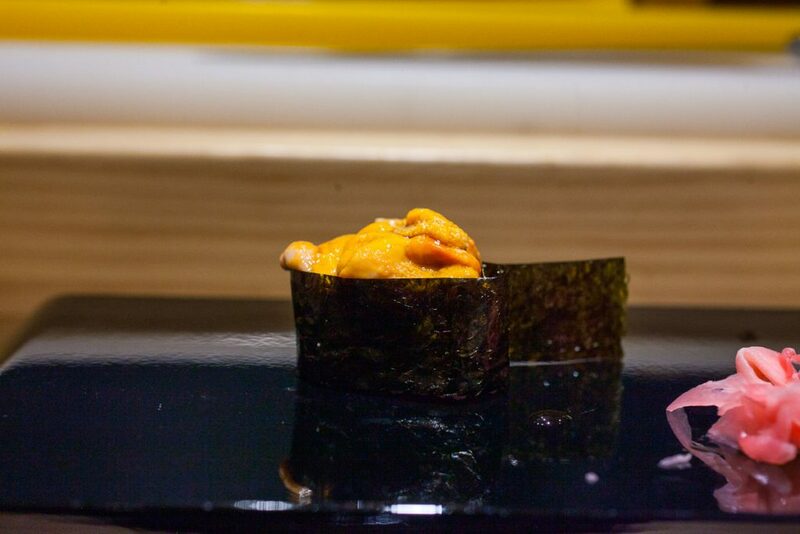 A kombu-marinated white fish, more uni, two pristine cuts of tuna belly and torigai, a type of shellfish, dabbed with soy. The service isn’t as refined as higher-end Japanese restaurants, but at Machiya you’re getting a quality meal for a third of the price. 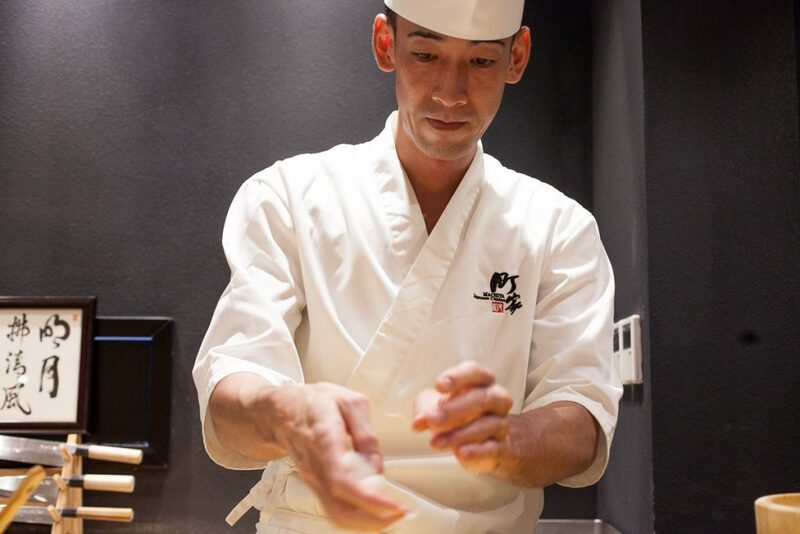 Also, Chef Naoki’s passion is infectious. 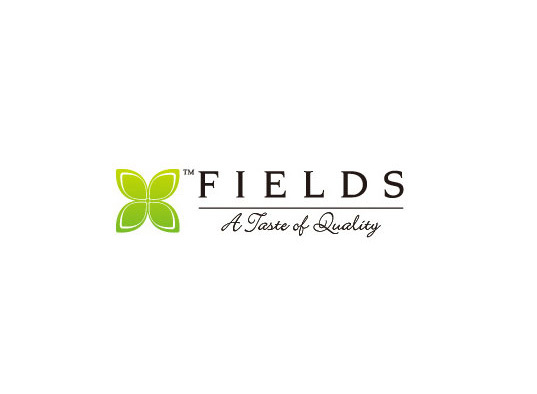 He may sometimes seem like he’s in a flow state as he plies his trade, but he happily jumps out of it to impart his deep knowledge of the cuisine. Go for the set and snag a seat at the bar. You’ll leave rolling content out the door, planning your next visit. My mouth is watering, heading to Shanghai in 2 weeks and I’ve been reading every one of your posts! Thanks for reading and welcome to Shanghai! Let me know if you need any recs!